There are endless varieties of meatball, or ‘köfte’ (KUF’-tay) dishes in Turkish cuisine. Endless combinations of ground beef and lamb, spices, fresh herbs, bread crumbs or bulgur are grilled, fried and baked. In Turkey, there is a type of ‘köfte’ for everyone. Although the name may seem simple, the flavor of this dish is extraordinary. It’s especially tender and juicy because it’s double-cooked. The meatballs and the potatoes are fried first, then put in the casserole with vegetables and sauce to bake to perfection. Spring and summer tomatoes work the best, but you can also use canned tomato puree during the winter months. ‘İzmir köftesi’ is a great do-ahead dish. In fact, if it sits in the refrigerator overnight, the flavors have a chance to blend and the taste is even better when it’s reheated the next day. Go ahead and try this favorite in your own kitchen. It may become a family favorite. Begin by preparing the meatballs. Put the ground beef in a large mixing bowl. Grate the onion and drain the extra juice. Add it to the meat. Wet the stale bread with warm water. Squeeze out the water and add it to the meat. Add the spices, chopped parsley, and egg. Knead the mixture together for several minutes until it’s well combined. Set it aside to let it rest for a few minutes. Break off walnut-sized pieces of the meat mixture and make oblong meatballs by rolling them between the palms of your hands. Put about 1 inch of oil in a large skillet and heat on high. Fry the meatballs until they are nicely browned on all sides. Drain them on paper towels. Peel the potatoes and cut them in wedges. Fry them in the same oil as the meatballs until they soften and turn a light golden brown. Drain them on paper towels. 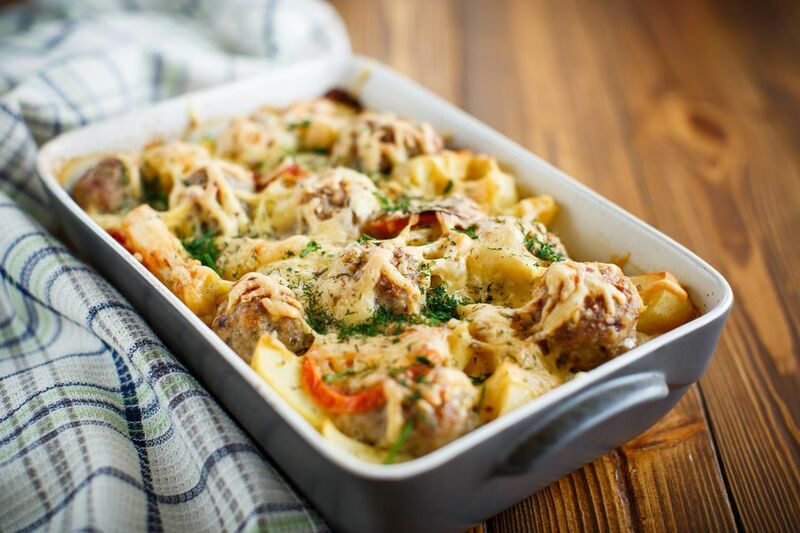 In a large oven-proof casserole tray, arrange the cooked meatballs to cover the entire bottom of the tray. Next, arrange the cooked potatoes evenly over the meatballs. Cut two tomatoes into wedges. Clean the green and red pepper and cut them into large strips. Arrange the vegetables along with the potatoes. For the sauce, grate two more tomatoes. Mix them with the tomato paste and hot water. Add the salt and pepper. Pour the mixture over the casserole. Bake it in a 390° F oven for about 30 minutes or until the tomatoes and peppers are softened and slightly browned. Serve your meatball casserole with crusty bread to dip in the juice.